Homework, hormones, heartache...middle school has no shortage of perils. 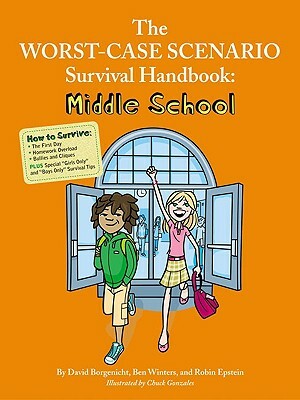 Never fear, the authors of the best-selling Worst-Case Scenario series return with a survival guide for those who are facingor just about to facethis big transitional time in school and life. The handbook is packed with funny-but-useful tips for the trickiest situations that crop up in middle school, like taking charge of a too-busy homework schedule, dealing with a cold shoulder from a friend who has suddenly become just too cool, avoiding common e-mail and cell phone disasters, and more. David Borgenicht is a writer, editor, publisher, and co-author of all the books in the Worst-Case Scenario Survival Handbook series. Ben Winters writes books, plays, musicals, articles, and lots of to-do lists. He lives in Brooklyn. Robin Epstein is the co-author of The Worst-Case Scenario Survival Handbook: Junior Edition. She lives in Brooklyn.